The Utica Shale occupies the eastern part of Ohio and underlies much of the Marcellus Shale in Pennsylvania, New York, and West Virginia. While full-scale development began somewhat later there than in the Marcellus, the Utica is already being heralded as an economic game-changer for construction companies in Ohio, particularly as the natural gas industry sets up shop in the state. In addition to the 255 Utica wells built since 2011 – which cost upwards of $11 million each and kept construction companies busy with everything from well site pads to new roads – there’s a growing number of processing and other commercial construction projects. Earlier this year, the nation’s second-largest natural gas producer, Oklahoma City-based Chesapeake Energy Corporation, began work on three new facilities to house their Ohio office near Canton. Their five-story, 85,000-square-foot office tower, 55,000-square-foot receiving and maintenance shop, and 6,000-square-foot repair shop are all being built by Ohio companies. Chesapeake also spent more than $40 million in road improvements in just one year in Mahoning County, which borders Pennsylvania. That’s 80 times the county’s annual road improvement budget of only $500,000. According to a report issued in March 2013, four other natural gas processing companies had Ohio projects on deck, ranging from $300 million to $1 billion-plus. Each was expected to employ at least 200 construction workers, 90% of them state residents. A smaller but no less significant project is the $150 million Pennant Midstream LLC natural gas processing plant under construction in Springfield Township, population 36,000. Several hundred workers from all trades are expected to be called up, according to the business manager of the local International Laborers Union. The president of the Western Reserve Building and Construction Trades council said that about one-third of the combined membership of the area’s trade unions is engaged in the oil and gas industry, with approximately 500 of them directly involved in shale work. That includes ironworkers, concrete workers, millwrights, and carpenters. As construction ramps up on processing plants and substations, the council chief speculated on even more work for the electrical trades. Because creating a strong bullpen of qualified workers is a concern, the unions have amped up efforts to train local tradespeople. That move has had an immediate payback: all of the 52 new welders certified in the past year have jobs. 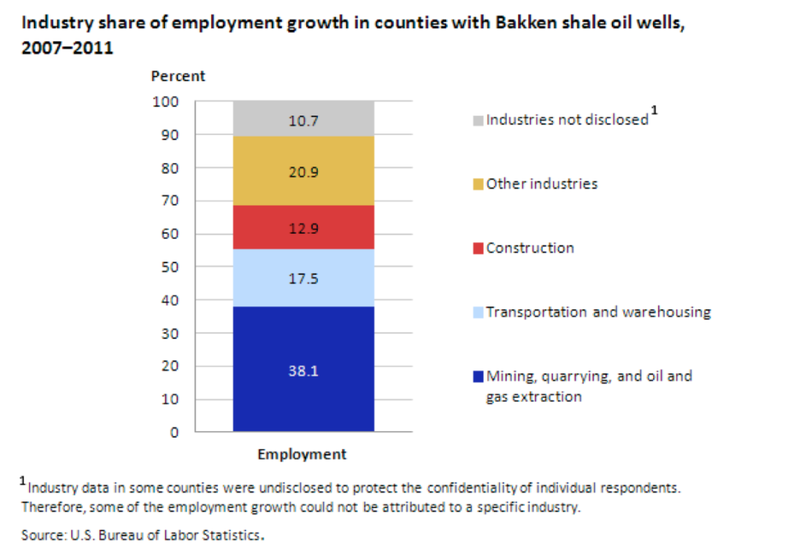 Beyond Ohio, shale development is building a construction frenzy throughout the US. The Marcellus Shale is credited with reversing a three-year slump in West Virginia’s construction industry. Between 2008 and 2011, state construction employment fell 19%. But more than half the ground was made up in just one year when, from June 2011 and June 2012, the number of construction jobs rose nearly 10%, to 36,700. During the same period, nonresidential construction spending climbed 14%. 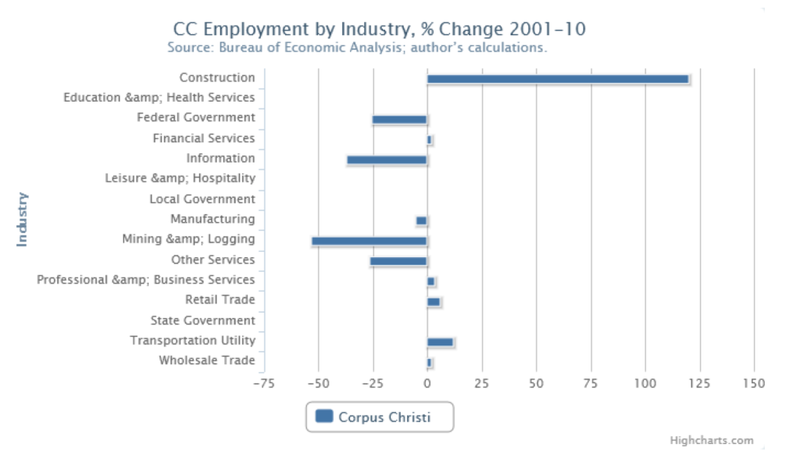 Corpus Christi’s construction industry surges way ahead of others. 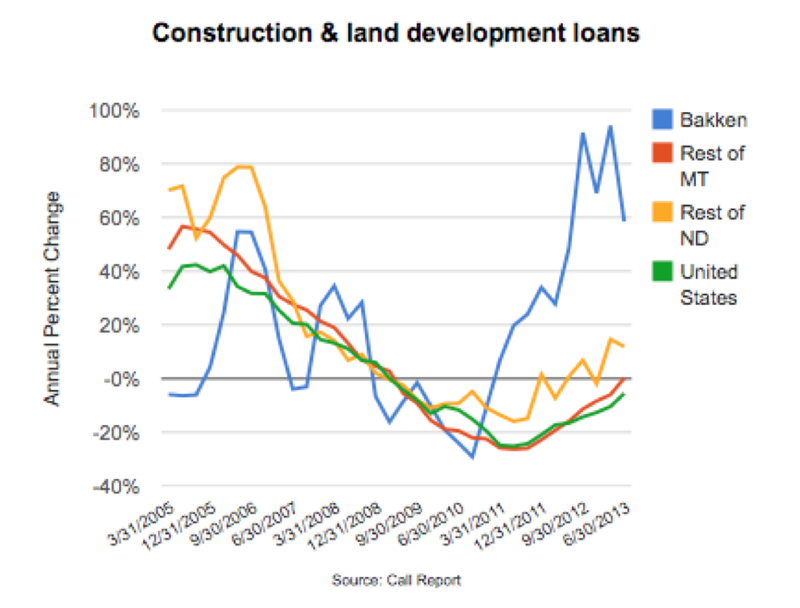 Construction loans are up in the Bakken, too. Bakken workers need a place to live. But because growth continues to outpace the labor market, the local workforce can’t fill all the open positions. According to the owner of a Montana commercial glass company, there is such a shortage of contractors bidding jobs in North Dakota that there’s almost no competition in hiring. In fact, since its first Bakken project three years ago, the glazier has worked throughout North Dakota. 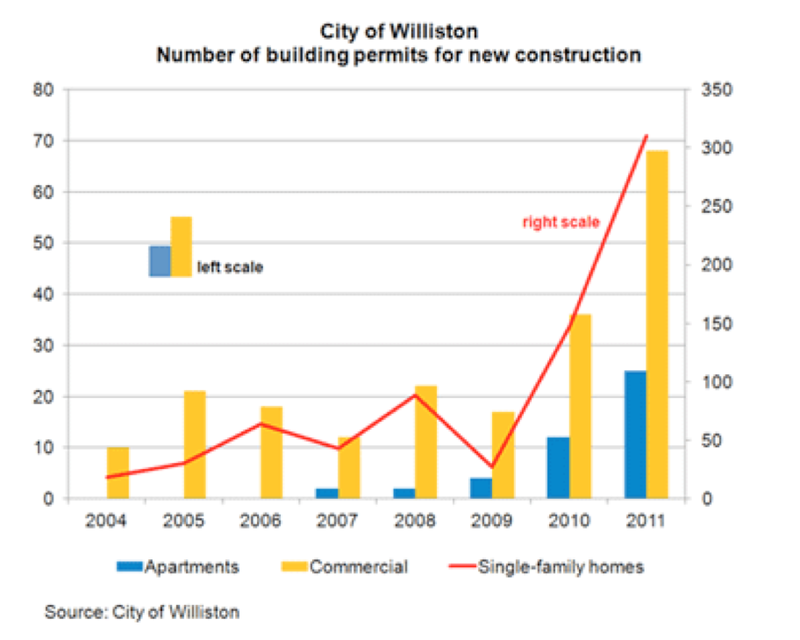 In Williston alone, the company has completed everything from small retail assignments to such large-scale jobs as major housing complexes for energy services provider Halliburton, which has been trying to outwit the regional housing shortage by building homes for its area employees. In addition to exporting construction personnel to North Dakota, Montana has also sent the Bakken another key resource: engineers. As a result of Bakken opportunities, one full-service civil engineering firm in Missoula not only reversed a declining business trend but also added a dedicated oil and gas division to its portfolio and opened additional offices in Fairview and Billings. 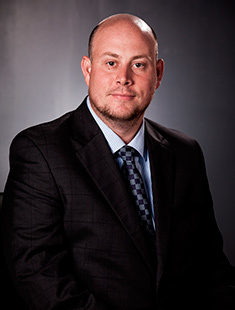 Likewise, North Dakota engineering firms working in the Bakken but headquartered outside of it are opening offices in small cities closer to the region, such as Minot and Dickinson. By reducing their employees’ commuting time in and out of the Bakken, the companies are finding it easier to add new staff. In the shale market, however, “easier” is a relative term. In the inaugural hiring survey of oil and gas industry recruiters by Rigzone, a multi-media provider of oil and gas news, 48% of hiring managers said they expected to boost hiring during the last half of 2013. Eight of the top 10 positions they’ll be looking for are engineers. 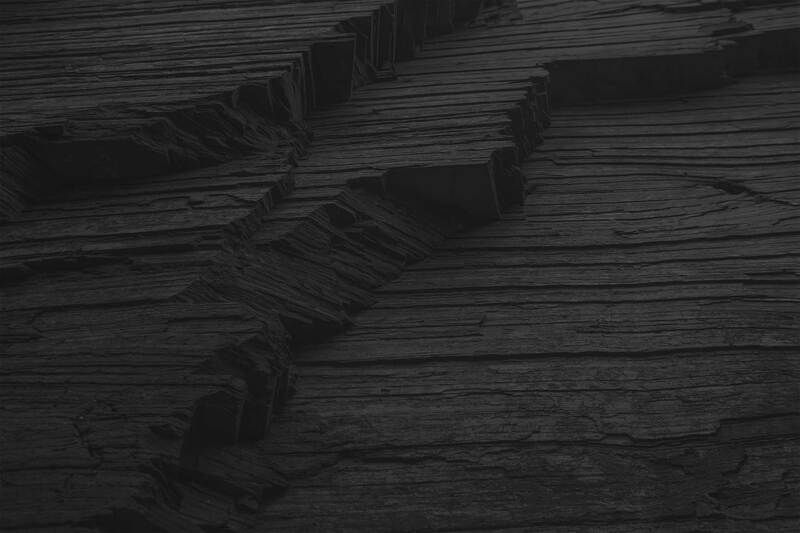 According to the survey, the most demand is for mechanical engineers, whose talent is needed for the hardware components of isolating well sections to create hydraulic fractures. Chemical engineers – who develop fracturing fluids and work to reduce related environment impact – plus civil, integrity, pipeline, and electrical engineers are also being sought en masse. Perhaps most vexing to hiring managers, however, is the lack of specialty engineers, with petroleum engineers topping the short list. This highly specialized worker searches out the oil and gas reservoirs, then determines the best extraction methods, equipment, and processes. Although the number of students earning bachelor’s degrees in petroleum engineering surged 181% to 753 between 2001 and 2011, there’s still more demand than graduates into the job market. Contributing to the squeeze is the fact that at least 40% of the world’s current petroleum engineers are expected to retire by 2025 or so. And on top of that, the 1980s oil bust discouraged young engineers from going the petroleum route, so there are few mid-level professionals to step into tenured predecessors’ shoes. Colleges are stepping up, however, racing to educate enough engineers so oil and gas companies can achieve their ambitious shale goals. Because of demand from the Eagle Ford Shale, Texas A&M University-Kingsville is reintroducing its bachelor’s degree in natural gas engineering, which originated in 1936 and was shelved in 2000. At the Colorado School of Mines, a drilling class in which students learn how to design well piping to prevent blowouts now accommodates more than 160 students, up from less than two dozen a decade ago. Perhaps most significant educational gambit is the $14 million private and public partnership aimed at enhancing the University of North Dakota’s (UND) efforts in petroleum geology and related fields. The funding includes a multi-million-dollar endowed chair in petroleum engineering and other dedicated research gifts, including laboratories and a virtual library. The dean of UND’s College of Engineering and Mines said the gift will have a lasting effect beyond the school and the O&G industry. By producing future generations of petroleum geologists and engineers, he said, UND will contribute to building a better world. And that’s the biggest construction project of all.